This is a tip for users with some sight. 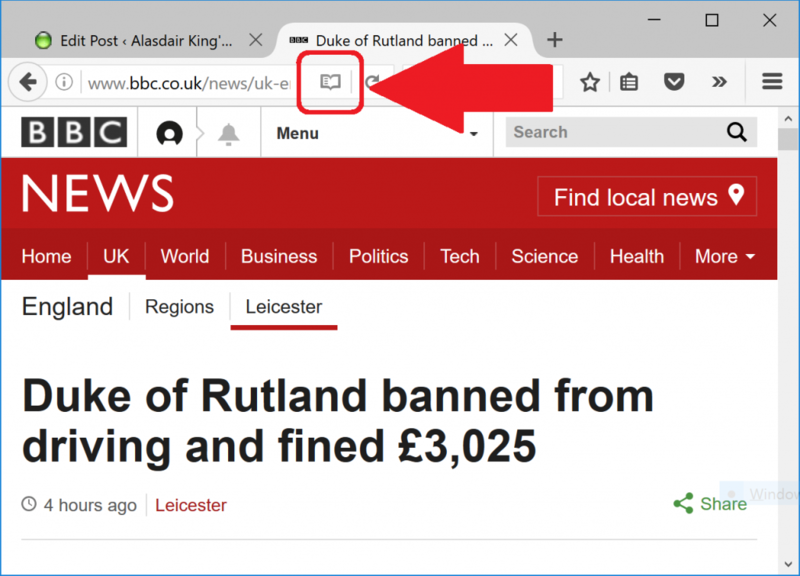 The Microsoft Edge and Mozilla Firefox browsers come with a built-in Reading View or Reader Mode (for Google Chrome there is an extension, see below). Reading View takes the webpage you are looking at, with all its adverts and pretty columns, and rips out the actual text you want to read and fills the browser with it. You can even make this text nice and big, and zooming doesn’t lose anything off the side of the page so you don’t have to scroll left and right. This is great for reading larger web pages online. You have to switch to Reading View for new every page you visit, though. It doesn’t happen automatically. In both Edge and Firefox you look for an icon of a book that appears on some pages to the right of the webpage address (i.e. the white box at the very top where you see google.com). If this icon appears and/or lights up, you can click on it and go into Reading Mode. For Google Chrome you have to install the free Readability extension from the Chrome Web Store to do roughly the same thing. You get a permanent button at the top right of the window, and you have to click it and select “Read Now” to go into Reading View.